The most commonly encountered medal awarded to a member of the Coastguard service is the Royal Navy Long Service and Good Conduct Medal. 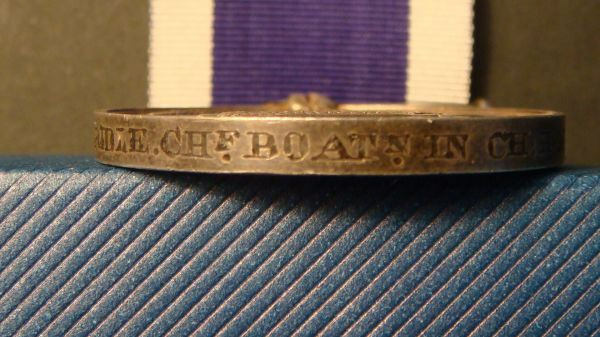 This medal was first introduced in 1830 and was awarded when a ship ‘paid off’, on a quota basis. The number of medals granted depended on the ships crew size, and was awarded at a ratio of 1 medal per 100 men, and then only to men with 21 or more year’s unblemished service (in 1853 this was reduced to 20 years). 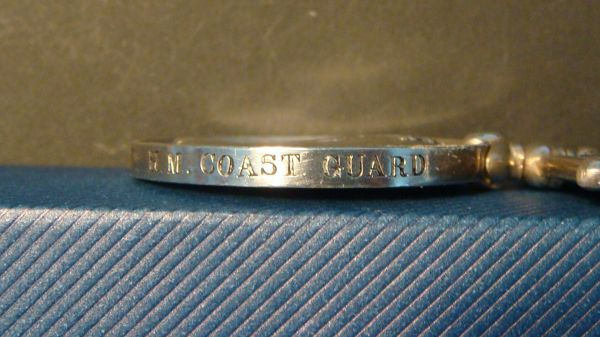 Despite being under Admiralty control from 1856, Coastguard men did not become eligible for the LSGC medal until 1873. Again a quota system was applied, but based on ‘Districts’ e.g. Kingstown had 4 awarded annually where Leith only had 1 every two years. Since the man had to do a minimum of 20 years service, it invariably followed that he had prior RN service. However it is still possible to encounter WS medals named to CG men because they completed their final, qualifying period of service whilst in the CG service. Below is an image of the LSGC medal. 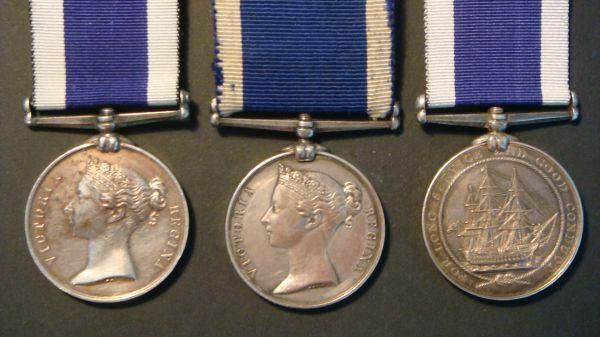 The central medal is the ‘Wide Suspension’ type (WS) introduced in 1847. To illustrate the subsequent change to the suspension, this is flanked on either side by the ‘Narrow Suspension’ type (NS), which replaced the WS type in 1875. The reverse of the WS type is identical to the NS type, and remains in use, unchanged, today. In 1875 the qualification period was reduced from 20 to 10 years, and the quota system scrapped, with the award being made at any time during the man’s service. However, if the recipient left the navy without completing 15 years eligible service, the medal was forfeit to the Crown. It was this change of qualification period, and the sudden increase in the number of medals awarded, which prompted the Admiralty to review the cost of engraving medals with the man's name and rank. As a consequence the cheaper ‘impressed’ method of naming was introduced. For comparison below are examples of both naming styles, with the medals used to illustrate this change both having been issued to Coastguards. In 1884, the Admiralty again reviewed the qualification period and increased it to 15 years. Prior to the award of the RN LSGC medal, the recommendation for the award was passed to the Admiralty, and a clerk would check back through a man’s service record to see if he had completed the necessary eligible time; that his record showed that throughout this period his character was ‘good’ or better; and that at no point had he ‘run’ e.g. deserted. This process is usually noted on the man’s service record by the words ‘Traced’, followed by a date. This date normally signifies the date of the award of the medal. Failure to meet any of these conditions would debar a man from receiving the medal. However, there are known instances where a man had ‘run’ at some point during his career, but a subsequent Captain had successfully written to the Admiralty requesting that this be removed, and that the medal be issued. Do you have an example of a GC "Badge"? The term ‘badge’ is really a misnomer, these were actually stripes worn on the left hand sleeve. If you visit the Portrait Section of the Forum and look at the photograph of Charles Greer and his wife, you can clearly see his 3 GC ‘badges’.